This is a simple type remote control by using RF communication without microcontroller. In this project a remote has been designed for various home appliances like television, fan, lights, etc. It gives lot of comfort to the user since we can operate it by staying at one place. We can control any of the appliances by using this remote within the range of 400 foots. In this project consist of two sections, transmitter (remote) and receiver section. Whenever we are pressing any key in the remote it generates the corresponding RF signals, and these signals are received by the receiver unit. 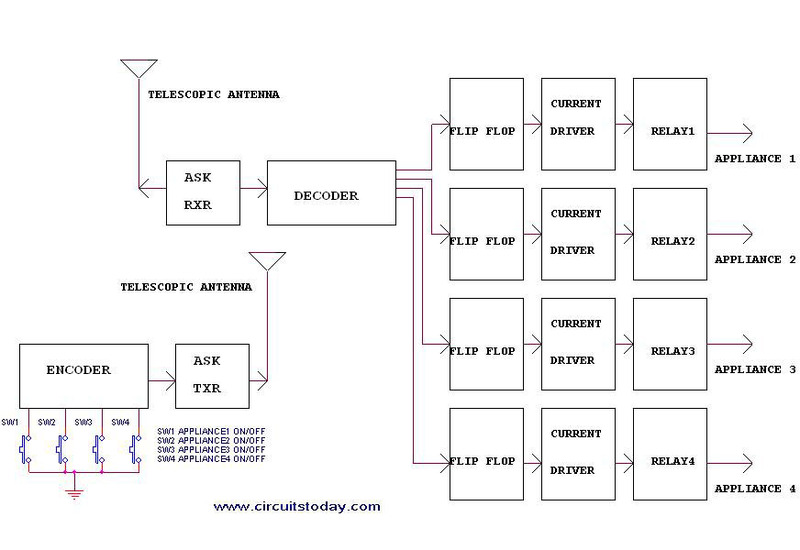 ASK transmitter and receiver is used as transmitter and receiver. HT12E, HT12D encoders and decoders are used in this electronic circuit. The block digram of the whole circuit is given below. In remote section consist of an encoder (HT 12E) and a ASK transmitter. The encoder generates 8 bit address and 4bit data. We can set the address by using the DIP switch connected in A0 to A7 (pin 1 to 8 ) encoder. If we set an address in the remote section, the same address will be required in the receiver section. So always set same address in transmitter and receiver. Whenever we press any key in the remote the encoder generates corresponding 4bit data and send this data with 8bit address by using ASK transmitter. The transmitting frequency is 433MHz. The transmitter output is up to 8mW at 433.92MHz with a range of approximately 400 foot (open area) outdoors.Â Indoors, the range is approximately 200 foot. At the receiver section ASK receiver is present. The receiver also operates at 433.92MHz, and has a sensitivity of 3uV.Â The ASK receiver operates from 4.5 to 5.5 volts-DC, and has both linear and digital outputs. It receives the datas from the transmitter. Then the decoder (HT 12D) decodes the date and it will enable the corresponding output pin (pin 10,11,12,13). Each output pins are connected to separate flip flops. The output of encoder will change the state of the flip flop. So its output goes to set (high) from reset (low) state. This change makes a high signal in the output of the flip flop. This output signal is not capable to drive a relay directly. So we are using current driver, SL100 transistor act as the current driver. The appliance is connected to 230V AC through the relay and the appliance will start. The relay will be re-energized when the same switch is pressed in the remote. This is because we are pressing the same switch in the remote control. The output of the decoder again goes to high so this signal will again change the state of the flip flop. So, the relay gets re-energized and the appliance goes to OFF state. Battery charger circuit using SCR. i want to control my machine with individual remote by RF method .what will be the cost of remote and receiver unit.approximately 12 nos required. But what shall i do to operate some small motor or other equipment momentary.I.E. it should operate while the remote button is kept pressed.Once we release the remote push button the o/p stops. Can you please guide me? Does this cd40174 need a clock signal? But if I remove the remote battery the circuit relays continuously ON.. Until connect the battery to remote.. Please say where is problem?? 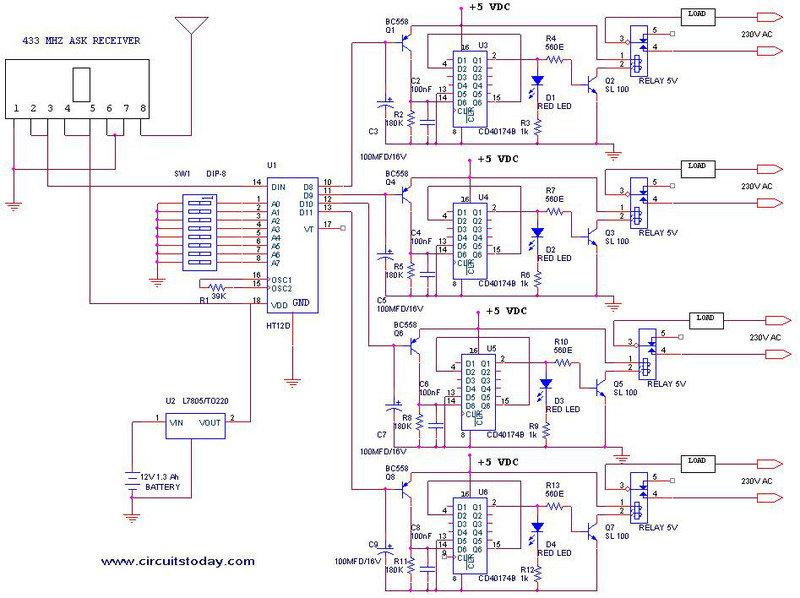 which software is used to simulate this remote control circuit through RF without microcontroller. Can we use ULN2003 relay driver chip to drive the relay instead of the flip flop current driver circuit? Hi Nayan ,yes you can ,but remember at the receiver section ASK receiver is present. The receiver also operates at 433.92MHz, and has a sensitivity of 3uV. The ASK receiver operates from 4.5 to 5.5 volts-DC, and has both linear and digital outputs. It receives the datas from the transmitter. Then the decoder (HT 12D) decodes the date and it will enable the corresponding output pin (pin 10,11,12,13). Each output pins are connected to separate flip flops. The output of encoder will change the state of the flip flop. So its output goes to set (high) from reset (low) state. This change makes a high signal in the output of the flip flop. This output signal is not capable to drive a relay directly. So we are using current driver, SL100 transistor act as the current driver. The appliance is connected to 230V AC through the relay and the appliance will start. The relay will be re-energized when the same switch is pressed in the remote. This is because we are pressing the same switch in the remote control. The output of the decoder again goes to high so this signal will again change the state of the flip flop. So, the relay gets re-energized and the appliance goes to OFF state. I was wondering if I could get a part number for the relay. I’m wondering if I am using the wrong type of relay. When I connect I get a constant buzzing and it is always closed, thus leaving my light bulb on. Please and thank you. if we press two on off butten at a time will it works??? dear sir, there is some confusion for me. in the receiver section the ICs (U3, U4, U5 & U6) mentioned as CD40714B. but, in the component list it is mentioned as CD4017. please guide me, which one is right for this circuit. the datasheet of CD4017 differs from CD40714B. do we require any code for dc motor control by using rf wireless communication …??? Hi!. This CD 4017 IC seems to be a decade counter IC. However, CD 4027 is JK Flip Flop. Kindly confirm the use of CD 4017 IC. Is it okay if i can remove the Flip flop and use the current driver?,connected to relay and then interfacing it with the Appliances. What type of relay is the one shown in the above diagram? Searching more I found this http://maxembedded.com/2011/09/06/rf-module-interfacing-without-microcontrollers/ what could be similar. But I do not have a way to get them in Dominican Republic. If there are substitutes I would like to know which ones. Basically we use quick reference like ECG and NTE. If any body can help me to have them let me know reference and place to pay for them, not problem it be in US. hi prakash, there is some confusion for me. what does the load connected to relay mean here? Hi, this site and circuits are very usefull. For remote circuits can i use existing IR remote just like CTV/DVD/AC remote to control various electrical equipments instead of creating another new remote. If it is possible please tell me in detail. No Nitin this is custom made. Why wasn’t my previous reply posted? I took good effort in putting the questions together! 1. Checked and confirmed that all connections and component values are as per he circuit above. 2. Can confirm that when any dip switch is pressed then then the voltage at pin 17 on the encoder goes high. That seems to indicate that it’s trying to send something to the ASK transmitter. 3. I dont know of a way to check the transmitter and if indeed its sending something out. I’ve checked that its receiving exactly 5volts as per the rest of the circuit. 4 on the receiving side, the voltages at pin 18 and the ASK receiver is measured at 5v exactly. The output pins 10 thru 13 show a -0.00 (?) on my multimeter. Pressing the switches don’t change any voltages here. 5. I have also replaced all components except the ASK components to confirm its not some defective part, but still no luck. I’ve checked youtube and loads of people have had success with this circuit apparently. One guy replaced the 39K resistor with a 51K one to make it work for him. I tried and still hasn’t worked. Note: I have not built the relay driving circuit but instead using bc558 transistors to drive an led each for each output to prove the concern works. If it does then I shall put the rest together. After 2 days I’ve kind of given up. My final suspicion is on the ASK components which I’ve ordered again. Any suggestion on what else i could investigate would be appreciated. Thanks for reading my post. I had made this and is working fine. For step wise testing purpose first remove rf tx and rx from circuit and connect data out pin of ht12e with din pin of ht12d.all 8 address pin should be in same positions in both circuit.u can sort all this 8pins together with ground directly without using dip switch(I have done this).in normal condition when both circuit is powered up the vt pin and all four output on receiver side will show u high.I.e 5 volt.u can attach five 5mm led on this output and vt pin for testing.on pressing any push buttun on tx side the related pin in rx side will go low I.e 0 volt and u will see led at vt pin flicker with every push. Can you tell me about how to pairing of the rf and tx. which component u had used as U3, U4, U5 & U6 in the the receiver section. pls tell me accurate No. whith which one can i replace the sl 100 tranzistor? ?bc547 is correct?this circuit is working properly but the relay which is 6 volt mine dont work…but the led flashes..it is wrong the 6volt relay or the bc547 with replace sl100?? i just want to know about how big both circuits are? here what is the use of 4017 ic…. Simple, because it is simple and easily available, low cost and easy to use. U can also use IR LED as medium. U have to use 555 ic for genrating 38khz. I build this and working fine for so many years. U can also get circuit using IR remote for 230V ac appliances control. Remote used is a philips tv remote. This required microcontroler. Working fine. What are you using for an antenna (small?)? A 12 bit encoder = 4,096 combinations. Are aware of a 32 bit encoder? its awesome it works perfectly thank u…….. and congrats who built it. 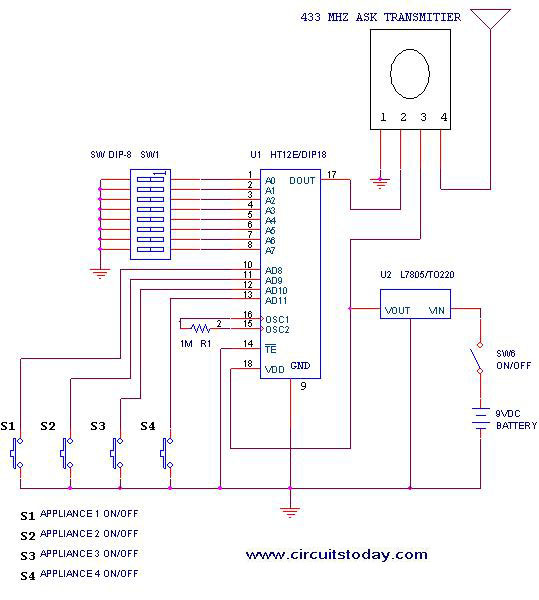 plz give me full data for tranmitier and reciever……..
Can anyone tell me how to add more security for this circuit more than just the dip switch… I’d like to apply this on our house to automate the parking gate so, I want to make it more secured. And also please indicate other alternatives for the IC’s(HT12E and HT12D) included in the circuit if possible. Guy u beta, wake up bcs am a nigerian 2, but i av mor dan enough common 555timer chip dat is every electronics shop. Moreover if u tink 9ja is worst goto iraq, mali, egypt etc. we made this project success. I’m trying to implement the circuit for a small exhibition in my college. Could you help me understand the design aspects of the circiut? First of all you have to do with,,…. If still nothing happenned you have to do is remove the rf module completely (both trnsmtr and rcvr) . Hi everyone, I Need help. I want to make a disco light that works on 220v power, to work of a remote, please can somebody help me, I found a remote and transmiter but it works on 12V power please help. Hi Avinash please go through Philips datasheet. I am not in Delhi. I am in the southern end,Kottayam,in Kerala.Here electronic shops are rare. May be I can find some of these special items in Cochin or so. Any way it’s a hobbey for me after retirement just out of interest. it was one of the good mini project,which help me in B.E. 6th semester. hello buddy does anyone can told me that i made this but not working may be my receving part is not working and i dont know why can any one tell me how can i give the vt in the ht12d i give it through 2222 transistor does it wright? I think you can get it near your local electronics store. Can you kindly inform as to where we can get these IC HD12 and the ASK transmitter and receiver.